Have you audio files with misunderstood filenames (for example, "track01.mp3", "file01.m4a")? You can change these filenames automatically if these files have nonempty tags. 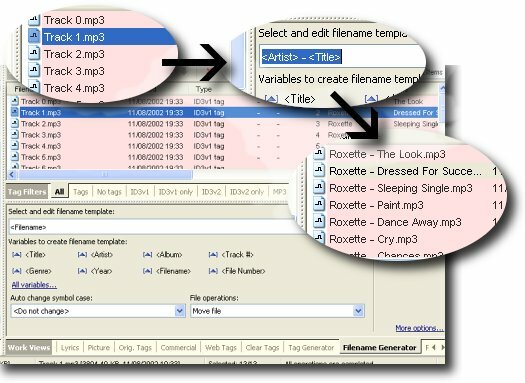 For example, you can generate filename "Roxette - Crash! Boom! Bang!.m4a" if file have tag Artist="Roxette" and tag Title="Crash! Boom! Bang!". For this please use Filename Generator. 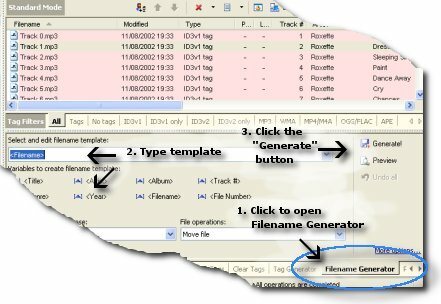 Click on the tab "Filename Generator" or click the "Filename Generator" button on the toolbar for open "Filename Generator" (see Figure 2). Type template. E.g. "<Artist>-<Title>". You can use all audio tags on template and audio file parameters also. Read more about templates. View full Templates list. Click the "Generate" for generation of new filenames. Hint: you can type the different templates for different audio files and change all filenames at once. Hint: you can preview new filenames without file rename. Click the "Preview" button for this. Click the "Undo all" button for undo changes. You can create folders using template. Template example with absolute path "C:\My Music\<Artist>\<Album> (<Year>)\<Track #> - <Title>.mp3". Template example with relative path "<Artist>\<Album> (<Year>)\<Track #> - <Title>.mp3"
You can copy files using template. Select "Copy file" on the "File operations" combobox. The source (original) file will not be changed. Hint: you can preview new path of files without coping files. Click the "Preview" button for this. You can change symbol case of filenames and folders. Select necessary variant ("all lowercase", "all capital", "begin with capital", "change the case", "the fisrt letter is capital") on the "Auto change symbol case" combobox. How can I generate tags from filename? How can I generate tags from other tag? The templates: automation of operations with your audio files.